For at least the last hundred years, there has existed an ongoing debate about the entity or hypothetical entity we call space. It has been called the vacuum, a container, or a physical substance of some kind. Einstein used it as part of a larger construct he called spacetime. He used this concept to bring forward a new concept for the force we call gravity, replacing Newton’s construct with one that explained more clearly, he thought, the motions and structure of the universe at the astronomical scale. Now this idea had a problem. For it to have the characteristics he gave it, that of being bendable, stretchable, capable of carrying electromagnetic waves, it needed some substance, some real physical characteristics which neither part (space, and time) of spacetime was able to contribute. So, in 1916 and later, in a notable address at the University of Leyden in May 1920, he agreed that his principle, General Relativity, could not exist or function without some medium filling spacetime. He chose to call that filler substance a “gravitational ether,” recognizing that an earlier ether concept of a particulate nature had been proven nonexistent by Michelson and Morley in 1887. Still, that didn’t settle the questions. Einstein made another point in his talk, that we should not attribute to his gravitational ether any kind of motion.. It may be that that caveat meant that he would not have to take such motion into account and have to revise his equations. It was sort of an escape clause in his model of the universe. Today, we still debate the questions of “what is space?” and “is there such a thing as an ether? Leaving those questions aside for the moment, today’s astronomers and cosmologist have found themselves wrestling with bigger questions. Most accept that the universe we can detect out many billions of light-years distant appears to be expanding, and at an accelerating rate, at that. What could cause and maintain that expansion? If there was a big bang at the beginning, some momentum could still exist, but that doesn’t explain acceleration, so there must be some other effect coming from somewhere else. Most astronomers today are convinced of the existence of mysterious entities they call dark energy and dark matter, partly filling the space between and around the so-called ponderable matter of planets, stars and galaxies, and calculated to make up making up as much as 96% of all matter in the universe. The dark energy appears to fill the universe and its presence is suggested to be the driving force behind the apparently accelerating expansion of the universe. Dark matter, on the other hand, appears to be more concentrated, in what some call patches, others filaments, closer to stars, galaxies, and clusters of galaxies. And while neither can be actually seen, dark matter has been presumed as causing certain gravitational effects such as lensing of light in astronomical observations and causing light and other radiation to be deflected when passing through these regions. 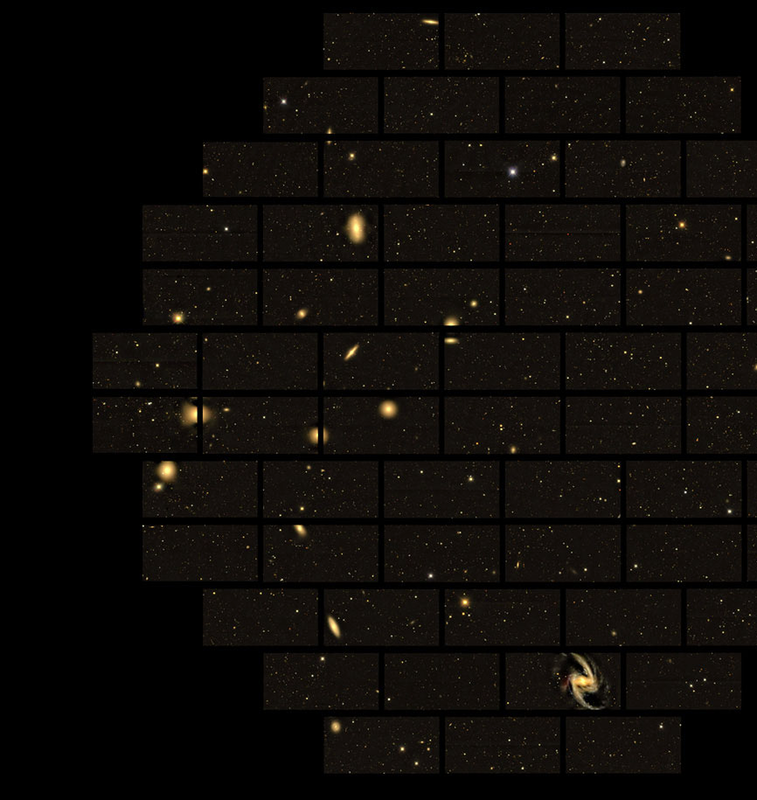 In the usual way some bright conceptualizers looked at accelerating expansion and this other mystery, dark matter, and thought, “what if they are connected?” Now of course we know how easy that is. Maybe one mysterious substance might be what is causing another mystery to occur. So far, thankfully, its still just a question. None of this has stopped the search for the nature, the content and the extent of dark matter. A few years ago an researcher at CalTech, Richard Massey, published some work that indicated that dark matter might actually be the scaffolding, the infrastructure for the formation of stars, since it seemed to be concentrated in regions heavy with new (and, some older) stars and galaxies. Massey published both his results, drawn from Hubble photographs, along with some computer simulations to show how this might be happening. I’ve previously posted those images on my blog and in my two books on this subject. 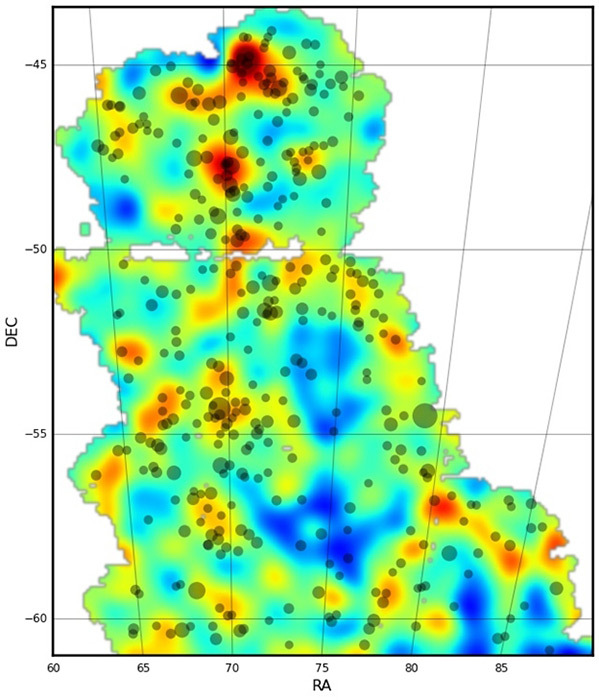 That portion of the sky is shown here and then the survey results, with some visual correlation between the denser regions of DM and the locations of the larger, brighter galaxies here in what’s called the Fornax Cluster. Figure 2. the same region in the DES survey. Red (hotter) regions indicate greater DM density (or just energy density?). We can see from these and other studies that we’re detecting something out there that isn’t a star or a galaxy and it has measurable effects on those stars and galaxies, or at least on our observations of them. And the two possibilities are that these are, for dark energy, some form of energy. And for dark matter, some form of matter, which would explain what we perceive as the gravitational effects we’ve observed. There isn’t anything else is there? some third fundamental entity? —outside of the E=mc2 formulation? Probably not. Those questions have ben a central topic in my own writings and study over the past several years. Might there be another way to look at this data? For example, what if everything is energy? And what do we perceive that field to be? Most, these days, call it dark energy. We know it’s there, or at least presume it’s there because otherwise we’d have no explanation for these other perceived effects, the apparent absence of predicted mass, etc. But because we can’t actually see it, and because of the love of the mysterious endemic to all astronomers, we call it dark energy— and speculate endlessly about its origins, its constituents, its presence. Is it really there or not? Now I’m going to ask you to step outside the multiple boxes of the standard model of particle physics and the standard model of cosmology, all the relativistic and “quantum” parts of them, and take a fresh look at what we’ve been seeing all these years. No, I’m not accepting the existence of something called dark energy or dark matter, but of something else that is out there and is neither mysterious or dark. It’s a clear night, billions of stars are shining our way, we’ve blanked out the astrological signs and the “constellations” of our ancestors and can start from scratch. Well, not quite that far back. We’ll start from these observations we’ve been making of the dark sky and its components. In general we’re agreed that it’s mostly full of energy, it’s not empty space. The stars, galaxies, and clusters, they’re energy, too, just really high concentrations of it. And what about those other things we’ve postulated as being out there, from cosmic dust to asteroids, comets, moons, even planets? Well, if you believe that wonderful equation, E=mc2, why, of course, all of that stuff is energy, too. Now there’s an idea. What if everything is made of energy? How would we go about explaining that? So let’s accept for a moment that the universe (all of it, that is), in it’s most basic, fundamental parts, consists of an essentially unlimited electromagnetic field. All energy, in a form we’re very familiar with. We can see it in the admittedly doctored CMB images, as a turbulent but fixed field of high energy, (relatively) high entropy, a background at an average temperature of about 2.7° Kelvin. And, we can see a small part of it in the DES images, a bit turbulent but I think we’re going to find out that everything is turbulent. Then, accept for a moment that the key elements of what we perceive as stellar, galactic, even planetary masses represent high energy concentrations in that field. E=mc2, after all. But for most part, possibly 96%, at least, it’s simply energy, and there’s a lot of it out there. So let’s assume that it’s our best known kind of energy, electromagnetism. That we know the math of, at least. Then, let’s suppose that those other things out there we can see, those planets, stars galaxies, once again, very high energy concentrations in that field, might have some effects outside of their perceived surfaces. Oh, actually, we know they do, Each has a “gravitational” effect, most have “magnetic effects,” light bends around them, most give off radiation at a very high velocity, and they have astronomical haloes! But again, in our still functioning love of mystery, we call those effects dark matter! And we give it mysterious powers, antigravity, among others. But what if we just take it as it is and call it simply a high, just not visibly high, distortion of the surrounding field. What have we now put together? We have a new vision of the universe. A simpler vision where we no longer need to reconcile the very small with the very large, where we no longer have to live with the contradictions and paradoxes of quantum theories, string theories, multiverses, ‘branes singularities, entanglements, wave-particle dualities, you name it, we’ve got it. Considering that even the smallest entities that we say have mass are also simply temporarily coherent concentrations of energy (remember E=mc2, again), then maybe we can see everything following the same rules, and we don’t need multiple theories to explain the world. And maybe William of Occam can stop spinning in his grave! What we have now is the simple universe. You can learn more about that from my books, the picnic at the edge of the universe, and its more complete follow-up, imagine darkness, and from multiple earlier posts on this blog. I’m in Patagonia, AZ today giving a talk (wellbeing and human habitats). Last night we stayed at a friend’s house in Patagonia and I brought by 10×50 Steiner binoculars as the nights here are extremely clear and very dark. The milky way was clearly visible and the sky was full – absolutely full – of stars (and the odd planet)…. I like very much where our collective thinking is going and I’m also re-reading William Hagen’s paper which seems to be thinking along very similar lines….I’m intrigued about the circumstances that create persistent – and presumably quite energetic – “spin” vortices in EM fields. Hopefully creative minds currently investigating QM will turn their attention to similar ideas.. If no one has done this already, I think the application of these ideas to EM energy fields might open some additional doorways that link QM and GR. I’d need a lot of time and oxygen to work my way through the topology math ( if I ever make it) but the 3D visualizations of “bundles” of intersecting spheres struck a chord or two as I was thinking about ways to depict persistent vortices -possibly rotating ones as well – in EM fields and how they come about (see Navier Stokes).